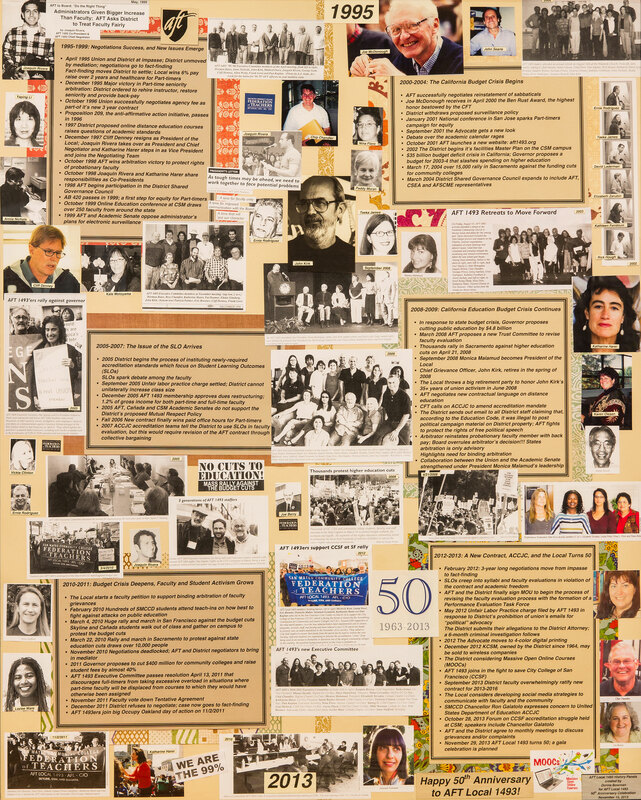 See the AFT Local 1493 history collage panels, which provide an historical narrative paying tribute to all of the people associated with Local 1493 from 1963 to 2013. 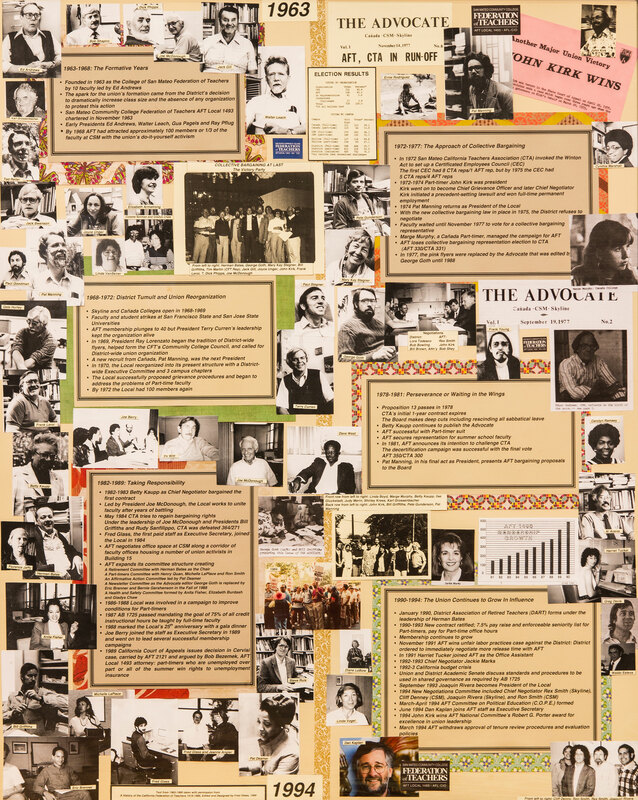 Click on the links below to see the panels which include text drawn from the chapter on our Local in Fred Glass’s A History of the California Federation of Teachers, 1919-1989, and from the pages of AFT 1493’s newsletter, The Advocate, which began publishing in 1976, and with images taken from the AFT 1493 archives. The panels were created by Donna Bowman for the Local’s 50th anniversary party in November 2013. Click here to view Panel 1 – 1963 to 1994. Click here to view Panel 2 – 1995 to 2013. The text below provides details of AFT Local 1493’s history up to 1989. AFT Local 1493 was founded in 1963 as the College of San Mateo Federation of Teachers by ten courageous faculty, led by Ed Andrews. The spark for the union’s formation came from the District’s decision to dramatically increase class size and the absence of any organization to protest this action. Led by Andrews, Walter Leach, Gus Pagels and Ray Pflug as presidents, Local 1493 moved into active debate with the administration over teaching conditions and educational policy. It also won the reinstatement of two teachers, Singh and Tunzi, fired by the District under the new probationary dismissal law. While attracting over 100 members by 1968, about 1/3 of the faculty, the Union’s do-it-yourself activism frightened many faculty. The Senate’s alternative was safe, albeit ineffective. The CTA waited in the wings, assuring its many members that it could resolve all problems through professionalism and expertise. In 1968-9 Skyline and Cafiada colleges opened and the District headquarters was moved. The faculty and student strikes at SF State and the faculty strike at San Jose State, along with CSM’s Black students’ demands for a beefed up Readiness Program, made unionism appear dangerous and membership plunged to about 40. President Terry Curren’s success was in insuring the very survival of the organization. Out of this setback came a number of steps forward. In 1969 President Ray Lorenza to began our tradition of districtwide flyers, helped form the CFT’s Community College Council and called for district-wide union organization. One of his most important recruits was a new Cañada teacher, Pat Manning, who succeeded him as president. Union membership began to rebound. The following year, the Union reorganized into its present structure, with a district-wide Executive Committee and three campus chapters. The dominant event of the year, however, was the tax election crisis. After voters rejected the tax proposition once, the second campaign was led by the District Business Manager under the slogan “Don’t Close Colleges”, referring to the threat to close Cañada and Skyline if it failed. AFT criticized the nature of the campaign, but faculty nevertheless had little choice but to comply and they made the difference in the positive outcome. The AFT began to seriously analyze District budgets at this time and produced a report and a series of bulletins. The Local also successfully defended CSM instructor Larry Stewart, who was dismissed for his public utterances during the Cambodia invasion. 1493 went on to successfully propose a grievance procedure and address the problems of part-time faculty. The capper came when Pres. Manning bet the Chancellor a case of beer in the spring of 1972 that AFT’s budget figures were closer to reality than the District’s. When the bet was won, the local celebrated with the now-legendary “Chancellor’s Beer Party”. AFT had 100 members once more. In 1972 the SMCTA, with the help of its statewide headquarters a few miles away in Burlingame, invoked the Winton Act to set up a Certificated Employees Council. The first CEC had 8 CTA reps and one AFT, but the Union gained one seat each year until in 1975 it was only a 5-4 split. From 1972-4 John Kirk, a part-timer, was president. He had been full-time, but had been cut back and the District convinced him not to file for reinstatement–the last time Kirk ever made that mistake. He went on to become the chief grievance officer, and later negotiator, for the Local and to initiate a lawsuit with precedent-setting value when he finally won a full-time permanent job. In 1974, Manning returned as president. While refusing to negotiate anything, the District cut the pay of day part-timers and dumped all the tentative agreements that had previously been made. With the new collective bargaining law in place in 1975, the District still refused any significant negotiations and unilaterally made division chairs into administrators, while the faculty waited until November 1977 to vote for a bargaining representative. After it was finally decided that all part-timers would be part of the unit, which was AFT’s position, Marge Murphy, a Cañada part timer, managed AFT’s campaign. The lively and contentious pink flyers were now replaced by the more professional Advocate, expertly edited by George Goth until 1988. The election count was AFT 330, CTA 331 and in the run-off campaign, led by part-timer Bill Griffiths, AFT lost 407 to 357, partly due to the votes of part-timers who were day teachers in neighboring CTA districts. When Prop. 13 passed and the CTA’s initial one-year contract expired, the Board made drastic cuts, including rescinding all sabbatical leaves. Under Betty Kauppe, the Union carefully did nothing to undermine the bargaining agent, but continued to publish the Advocate. CTA, the following year, brought back a disastrous contract. The faculty ratified it despite losing all sabbaticals, past practice guarantees and weakening the grievance procedure. The Union continued its ultimately successful part-timers’ suit, secured representation for summer school faculty and, in 1981, announced its intention to challenge CTA. The decert campaign was quiet by contrast, mainly consisting of Advocate articles and one-on-one contacts. The Local did not gain votes, but the CTA lost them massively. The final vote was 350 to 300. Pat Manning, in his final act as president, presented AFT’s bargaining proposals to a newly polite and attentive Board of Trustees. With Betty Kaupp as chief negotiator, the Union bargained some improvements in the first contract for 1982-3 and began the long process of uniting the faculty after years of internecine battles. The process of winning over the CTA members and the uncommitted was led by President Joe McDonough, a demon recruiter whom full-timers at CSM ignored at their peril. The CTA, in May, 1984, made a last stab to regain bargaining rights. But excellent work had been accomplished by McDonough and Presidents Bill Griffiths and Rudy Sanfilippo after him. Together with grievance wizard and chief negotiator John Kirk, they had made AFT stronger and the CTA was defeated soundly, 364 to 271. The union hired its first paid local staff, Fred Glass, who had been a member of the union’s executive committee as a part-timer and then full timer at CSM. The Union, thus bolstered with an Executive Secretary, embarked upon consolidation. Local 1493 negotiated office space at CSM along a corridor of faculty offices housing a number of union – activists. The local bought a computer. It expanded its committee structure, creating a retirement committee with Herman Bates as chair; a part timers’ committee with Henry Quan and then Michelle LaPlace and Ron Smith breathing new life into the old struggle; an affirmative action committee led by Pat Deamer; and a newsletter committee (it took a whole committee!) to replace George Goth as editor of the Advocate, with Eric Brenner in charge, – assisted by Bernie Gershenson. Anita Fisher, Elizabeth Burdash and Gladys Chaw formed a health and safety committee. The union also formed several joint committees with the administration – a far cry from the early days of intransigent District-union relations. There was never a shortage of helping hands for folding and addressing faculty communications along the corridor of building 15 at CSM. A major campaign was begun in 1986 to improve conditions for part timers, which finally resulted in serious negotiations with the District late in 1988, but not until faculty had packed two Board meetings demanding action. In 1986 AFT initiated a claim for tenure and back pay for 11 part-time English composition instructors, a case still pending in mid-1989. The gala dinner celebration of 1493’s first 25 years, held in fall of 1988 under the leadership of new President Steve Ruis, promised to start a new chapter in the history of the local. That promise was immediately fulfilled in the spring of 1989. New Executive Secretary Joe Berry led a full membership campaign” with AFT staffer Clair Norman. With the phone banking assistance of dozens of full- and part time faculty, over 100 new members were brought into the union, strengthening the entire faculty. AFT 1493’s story shows that diversity is not insurmountable if open democratic processes and a consistent emphasis on unity are pursued. With this, and regular advocacy for faculty, the success of AFT’s version of militant teacher unionism is assured.